Snrky: I'll never understand fiscal year end logic. I never received such a threat in my days on large company projects, but I am no stranger to the perverse year end logic that often meant trying to spend large sums of money as quickly as possible. I guess like work, money will get spent to meet it's allotted budget, or something like that. Snarky: I'll put it this way. 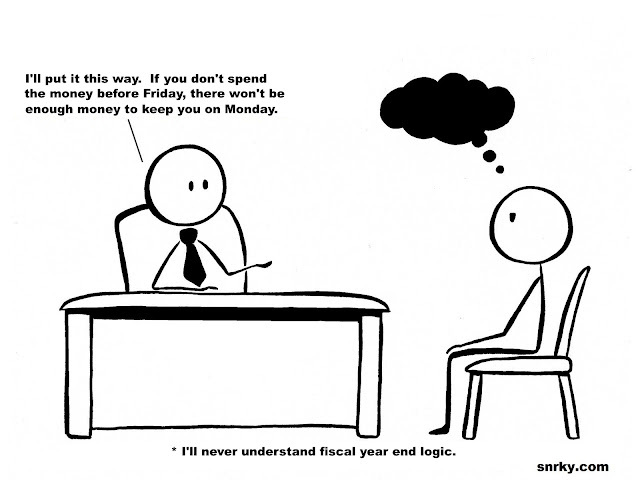 If you don't spend the money before Friday, there won't be enough to keep you on Monday. Fiscal year end magic. I was reading an article the other day related to something I heard on Indie Game the Movie that said that game developer pay out was related to how well they scored on Metacritic. The idea of planning a budget around random reviews seems insane.